A group of parents, including Mariela Lepe, in red sweater, received help from Choice 4 LA with applying to LA Unified’s magnet programs. 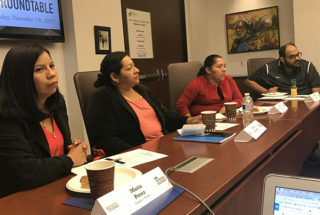 Lepe attended a roundtable discussion in December that was organized by Parent Revolution to share their experiences with the new unified enrollment system. A record number of parents this year are trying to get into LA Unified’s magnet and dual-language programs, and for the first time, they were able to use a new unified enrollment system that simplifies the application process. District officials said most parents who used the online system gave positive feedback. But some parents encountered errors while others needed outside support to navigate it. The new enrollment system allows parents to fill out a single online application for the 260 magnet schools and programs and the 132 dual language and bilingual programs, the district’s popular “choice” programs that allow students to attend an LA Unified school other than their neighborhood school. Independent charter schools in LA Unified were not included in the unified enrollment system. More than 62,000 applications were received during the month-long open enrollment window in October, up 14 percent from the previous year. Magnet applications increased 6 percent, to 54,000. Of particular importance for a district struggling with persistent declining enrollment, 18 percent of the applications were for students not currently enrolled in LA Unified. The district is losing about 12,000 students a year as rising rents force families out of the city, birth rates decline, and growing numbers choose charter schools. Expanding its magnet and dual language programs is a key district strategy to retain and attract families. George Bartleson, chief of the district’s Office of School Choice, credited the increase in applications to the “faster, more intuitive, and mobile friendly” way to apply. Including bilingual programs also contributed to the increase, he said. The district received 4,200 applications for dual-language programs for the 2018-19 school year. And it expects that number to rise through this spring as applications continue to come in through the spring application window, which opened Feb. 1. The number of dual language programs in the district has more than doubled in the past five years. Last year there were 101 programs, and 31 more are being added throughout the district this spring. The number of seats available in dual-language programs for next year are still being determined. There are 34,463 magnet seats available for the 2018-19 school year; about 1 in 3 applicants to a magnet program were accepted last year. Students who aren’t awarded their first choice may be placed in their second or third choice selections. Some parents apply to magnet schools they do not want to attend in order to accrue wait-list points. LA Unified has been aggressively growing both its magnet schools and dual-language programs, as their magnets have been proven to outperform district neighborhood schools and charter schools, and research shows that dual-language programs are the most effective model to educate students who have limited English skills. Bartelson said 87 percent of the applicants gave positive feedback when submitting their applications, but some parents ran into problems. “It has been a frustrating process,” said Christina Nairn of Westchester, whose son attends Open Charter Magnet, which is both a charter and a magnet school, so she already was familiar with the district’s application process. But when she tried to enroll her daughter for kindergarten at the school, her application was kicked back. She believes those two mistakes in her application could have been fixed over the phone, and despite waiting an hour and a half on hold, it still hasn’t been fixed. She was told by the district employee who took her call that she had to send a correction request by certified mail. She mailed the document Jan. 10 and has yet to receive a response. Other parents, like Mariela Lepe from South LA, couldn’t even get into the system by herself. Ruth Olivares is a community organizer with Parent Revolution, a parent advocacy organization in Los Angeles that helps families in underserved communities navigate the school choice process by evaluating school quality, understanding their options, and applying for schools. Through the group’s Choice4LA program, she helped Lepe use the new unified enrollment system. “So far we haven’t met a parent who doesn’t want to explore school options for her kids,” said Olivares during a parent roundtable organized by Parent Revolution in December. With help, Lepe was able to apply to a magnet program for her fourth-grade daughter, Jazmine. The idea of having Jazmine attend a high-quality school moved Lepe to tears. “I know my daughter deserves to excel in a good school. I can’t wait to know my application was accepted,” the mom said in Spanish. A second application window opened Feb. 1 for slots that are still remaining, and parents can apply through the echoices website. They will begin to be notified in mid-March. Those who applied online will receive notifications in their apply.lausd.net parent account. Parents who submit a paper application will receive a letter in the mail. Parents can request free, personalized support to find quality public schools for their children through the Choice4LA program at https://choice4la.org.